Wondering what St Petersburg cheap eats are? They're inexpensive cafes, bars and restaurants where small plates of delicious, cheap food are served up. If you're on a low budget vacation or you don't want to flatten your wallet for just one meal, don't worry - dining out in St Petersburg doesn't have to cost an arm and a leg. The city is full of great value restaurants, Russian cafes, food chains and takeaways where you can enjoy a meal and spend less. People queuing at Teremok, a local fast food restaurant in St Petersburg, Russia. With no more than $15/13€, sometimes even less, you can fill your stomach with traditional Russian food or tasty sushi, pizza, pasta and burgers along with a drink of your choice. So if you aren't in the mood to dine at expensive restaurants because you feel stretched for cash, check out our top spots for St Petersburg cheap eats. We've made a list of what we believe are the best new and old options for eating out on a budget for both lunch and dinner. Tip: If you just want a fast meal, aside from our St Petersburg cheap eats list you can choose from a wide range of classic fast food chains, such as Pizza Hut, KFC, McDonalds, and Russian street food, like Pirozhkovaya or Teremok. Here you will find the popular Russian bliny, pirogi and pishki. Gourmet Burgers, Vegetarian Menu, Trendy Atmosphere! If you've spent the day sightseeing and you're in the mood for a great burger, Clean Plates Society has gourmet burgers galore. The Italiano Burger, Falafel Burger and Club Burger are highly rated in the burgerlicious category and the soup, salad and vegetarian menu offers a wide range of tasty selections. A favorite spot for young locals and popular because of the friendly, positive, easy going staff, this trendy inexpensive cafe in the heart of St Petersburg offers a hipster interior, free WI-FI, good wine list, great cocktails and totally awesome pear crumbles! No Booking in advance required! Fun drinks, Live concerts, Young Crowd! The name means 'Sweater with Deer' which is translated as, “We're tastier than deer and cozier than sweaters”. This St Petersburg restaurant has a ski lodge atmosphere with a wooden deer head on the wall, dim lighting, chopped firewood and window seats overlooking the Kazan Cathedral. There's an extensive drink list with catchy names - like Rudolph's Nose - friendly staff, live concerts, fish & chips and Indie Burgers. Looking for a stylish place to meet friends, enjoy simple, but tasty dishes and chat the night away? Open Kitchen, Fresh Food, Reasonable Prices! In the market for simple food at a good price in a lovely setting? This cheap self-serve cafeteria-style restaurant feels like the farmer's market. At Market Place, loads of fresh vegetables, live plants and quirky details create a charming atmosphere and fun energy that is supported by helpful, friendly staff who are always happy to answer your questions. A popular lunch is soup, salad and a cookie, but there's grilled food, Asian food, pasta and Russian specialties too. Fresh to order or prepared on request, it's always bustling in this charming St Petersburg eatery, so we recommend having someone in your party save your seats while you make your selections! Tiny Cafe, Large Servings, Phenomenal Food! In the heart of St Petersburg you can find Sup Vino a tiny cafe, with a small menu, that serves big portions. Don't blink and miss the chance to go here though! With only five tables and bar stools in a sleek, but cozy setting, this is one of the best St Petersburg cheap eats and is known for its tasty soups, huge salads, fresh juices, pastas and wine. Simple, but outstanding food makes this in an easy place to relax and linger. Their soups are amazing, especially the French Onion Soup with a delicious cheese crostini melted on top. Wine Soup warms the heart and the tummy. A Large menu, Affordable prices, Family-friendly atmosphere! One of the Imperial city's best-loved and most versatile St Petersburg cheap eats, Zoom Cafe caters for families, friends, couples and singles. There are books, games and puzzles for kids and an extensive selection of teas, juices and alcoholic beverages for adults. The broccoli soup, salmon in cream sauce, Stroganoff and borsch get high marks, as do the owners and wait staff for making Zoom a friendly and affordable place to enjoy a fantastic meal. Great Pizza, Friendly Staff, Outdoor Patio! Near the metro station Moskovskie Vorota and only one block down the street from the Holiday Inn, this casual pizzeria is the perfect place to pick up some pizza for lunch, dinner or a take-home late night snack. Their friendly and helpful staff, nice outdoor patio area, pleasant décor and reasonable prices make Studio Pizza one of the most popular St Petersburg cheap eats among locals and visitors looking for great Italian or Russian food at the lowest price. Chinese Cuisine, Good Quality, Reasonable Prices! Tan Zhen restaurant has expanded to three locations in St Petersburg due to its popularity. With a traditional Chinese dining room with bamboo artwork, lacquer screens and oriental furnishings, this chain of restaurants offer spicy selections with an international flair. If you've got a craving for spring rolls with tender shrimp, piping hot rice and tasty vegetables, you can count on it to be freshly prepared and served in hearty portions. The food is of good quality, the wait staff are attentive and professional and the budget-conscious guest is sure to have a satisfying experience. Fast Service, Low Prices, Delicious Food! You can't leave Saint Petersburg without stopping at Chainaya Lozhka and trying their local specialty - stuffed blini (pancakes) made with a variety of sweet or salty fillings. The blini here are excellent for breakfast, lunch or dinner and an extensive variety of the most popular teas and a salad bar make this restaurant chain a favorite dining spot in the city. With one ideally located near the train station open 24/7, this is a perfect place to grab a snack when traveling to or from Moscow. Pleasant, comfortable atmosphere with quick and courteous service, you can get all of this at a budget price! Stuffed Potatoes, Many Locations, Very Filling! If you're new to St Petersburg, Kartoshka means “Little Spud” but there's nothing little about the fillings at this St Petersburg chain of restaurants and kiosks. An assortment of toppings will turn your little potato into a hearty meal! Every spud comes with a healthy slab of butter, scoop of cheese and choices of diverse toppings, like bacon, mushrooms, peppers, ham, crab, cream sauce, meat, stew and fried onion chips. Simple, delicious, affordable and filling. Eat up and wash it down with tea, coffee, Coca-cola or beer. Add soup and a panini and it's extra scrumptious! Fast Food, Healthy Menu, Take Out! Fasta Pasta is for those on the go. Choose your favorite pasta shape, select a stuffing, top it with a sauce and take it out in a lunch box. Stuffing's include salmon, meat, mushrooms or vegetables. Sauces include pesto, bolognese and carbonara. Pizza slices and soup are also on the menu. Clean interior, cheerful service and affordable pricing. Very basic, but if it's a quick, healthy, nourishing meal you're after, this is a great choice. Authentic Russian, Fast Food, Excellent Selections! 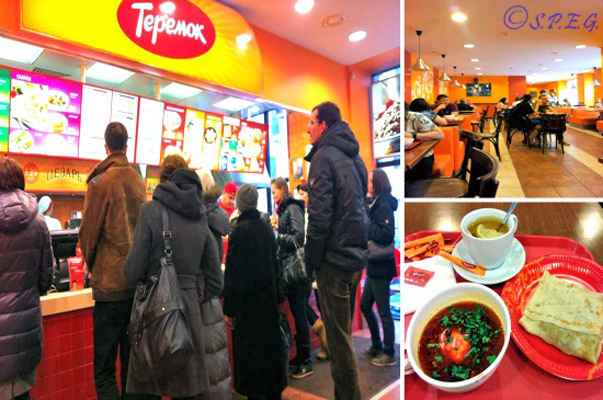 Teremok is the affordable and healthy way to experience authentic Russian cuisine. There are 50 stands around St Petersburg, so it's convenient to try delicious take-out wherever you go. The borsch, ukha (fish soup), pot stickers, buckwheat porridge, potato salad and syrniki with sour cream are delicious. If you're craving pancakes, they've got an assortment of fillings: mushrooms, eggs, jam, salmon, ham, condensed milk (very Russian), apple and caramel, honey and sweet cottage cheese. Traditional drinks, Sbiten (warming for winter) and Kvass (for summer) are also offered. Yum! Need we say more? Well you should know that Teremok is the most popular cheap eating place across the whole Russia, so many Russians go there.